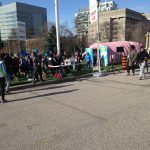 Despite the cold weather and snow flurries at Queen’s Park in Toronto on April 29th, participants showed up in large numbers for yet another successful Bum Run. 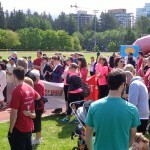 Close to $30,000 was raised by CCC participants to support our awareness and patient support programs. 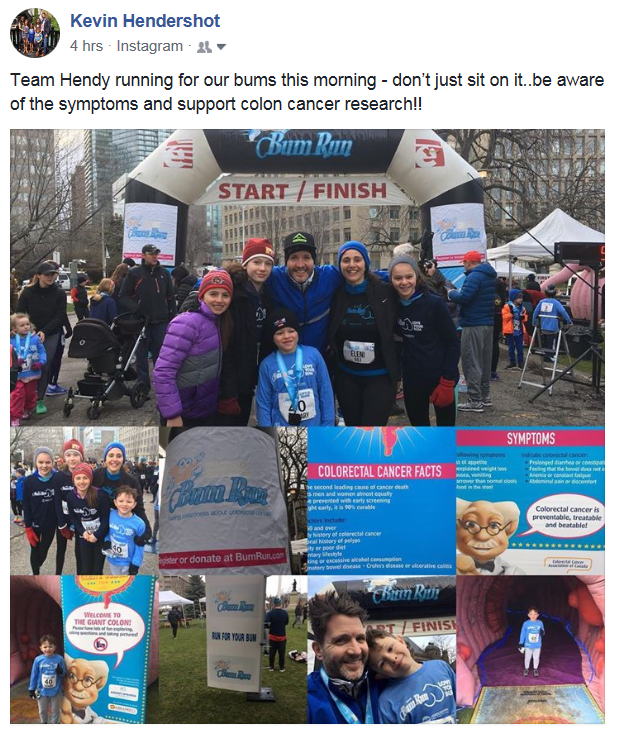 Thank you for your tireless fundraising efforts and braving the elements..
As in previous years, our magnificent Giant Colon was set up near the start/finish line and it proved to be as popular as ever with young and old alike. 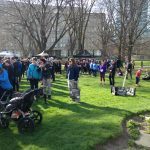 After all the participants crossed the finish line, they feasted on pancakes and bananas and then gathered around the stage for the presentation of the various awards. 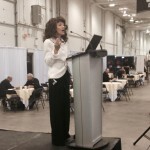 CCC’s Filomena Servidio- Italiano was once again the top individual fundraiser. 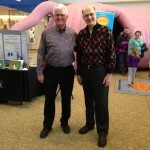 Special thanks to Ted Trueman, Gino Lombardi and Michael Trueman for showing up at 5:00 am to assist staffer Frank Pitman with The Giant Colon. 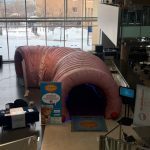 On February 14, 2017, The Giant Colon Tour visited the Jean-Coutu Pavilion at the Université de Montréal. 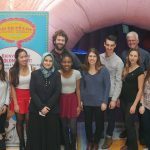 This well attended event was held in the impressive Morris and Rosalind-Goodman atrium in partnership with students from the Department of Pharmacy. 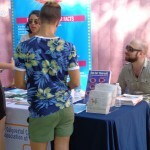 The goal of this activity was to raise awareness of colorectal cancer, discuss the benefits of screening and healthy lifestyles, and learn how to prevent the disease. 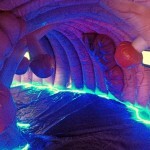 With the theme “In the Heart of the Colon” in honor of St. Valentine’s Day, hundreds of students walked through the Giant Colon with great curiosity and enthusiasm. 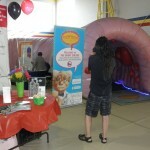 In addition, several staff members took a few minutes of their busy day to visit this impressive awareness exhibit. 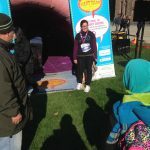 The students also organized a photo contest where the participants took a picture with The Giant Colon and published them on Facebook under #colongeantudem for a chance to win several prizes. 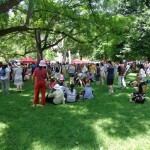 The event was a real success and the CCAC is proud to have been a part of this event at this famous Montreal university. 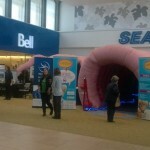 Niagara Health System’s (NHS) Colorectal Screening Program, in partnership with Juravinski Cancer Centre in Hamilton, brought the Giant Colon Tour to the Pen Centre in St. Catharines Ontario as part of Colorectal Cancer Awareness Month. 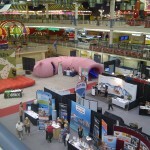 Colorectal Cancer Association of Canada’s (CCAC) pink inflatable walk-through reproduction of the human colon is 40 feet long and eight feet high. 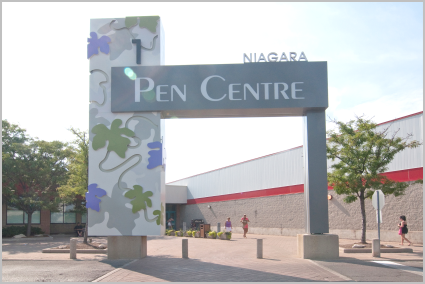 The exhibit attracted over 2,300 visitors on Friday March 4th and Saturday March 5th, 2016. 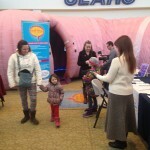 The NHS partnered with The Giant Colon Tour, an educational exhibit part of the CCAC campaign that seeks to educate Canadians that this disease is preventable, treatable and beatable. 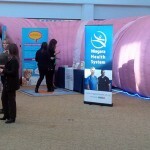 A team of registered nurses and health promotion specialists from Niagara Health System’s Endoscopy department were on hand to offer information about screening and prevention. 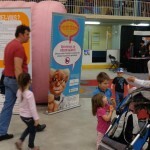 Dr. Meghan Davis, CCO Regional Primary Care Lead and Dr. Pierre Major, the Chair of the CCAC’s Medical Advisory Board were also on hand to speak to the numerous visitors from the Niagara Region. 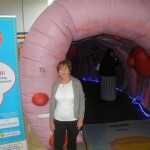 A special thanks to Ruth Peters (NHS) and Andi Sinclair (Brock University), who were instrumental in bringing The Giant Colon Tour to the region for the second time since 2010. Shoppers will have more than deals and merchandise to attract their attention at the Pen Centre on Friday, March 4 and Saturday, March 5. 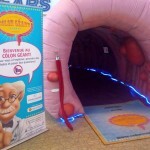 They’ll also have a unique opportunity to walk through a giant colon to learn about colorectal cancer and other diseases of the colon. 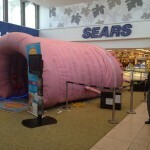 Niagara Health System’s Colorectal Screening Program, in partnership with Juravinski Cancer Centre in Hamilton, is bringing the Giant Colon Tour to the St. Catharines shopping mall as part of Colorectal Cancer Awareness Month. 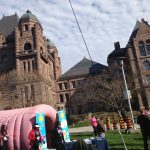 Colorectal Cancer Association of Canada’s (CCAC) pink inflatable walk-through reproduction of the human colon is 40 feet long and eight feet high. 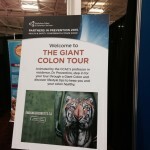 The NHS has partnered with The Giant Colon Tour, an educational exhibit part of the CCAC campaign that seeks to educate Canadians that this disease is preventable, treatable and beatable. 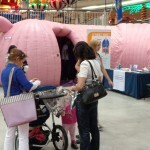 A team of registered nurses and health promotion Specialists from Niagara Health System’s Endoscopy department will be on hand to offer information about screening, a simple process that helps to identify the risk for developing cancer. 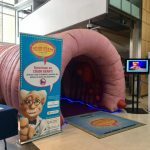 The CCAC’s visiting professor Dr. Preventino – a puppet – will greet all visitors and guide them on their voyage through The Giant Colon. 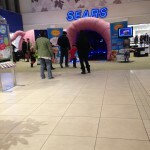 Visitors will view everything on a large scale, from Giant Hemorrhoids to Giant Polyps and much more. 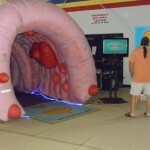 While exploring The Giant Colon, Dr. Preventino will provide visitors with healthy lifestyle tips and explanations of the various diseases on interactive media screens. 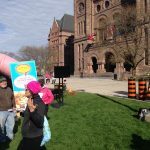 When: Friday, March 4 from 10 a.m. to 9 pm. 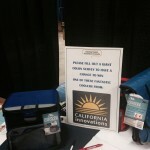 and Saturday, March 5 from 9 a.m. to 6 p.m.
Why: To raise awareness about colorectal cancer and the importance of regular screening. 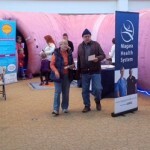 A wide variety of health and safety exhibits, including The Giant Colon, provided a bevy of important information to area residents in Rama Ontario on Thursday September 24, 2015. 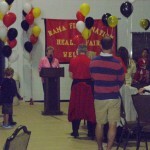 With a theme focused on “Community Learning for Healthy Living,” the Rama First Nation’s 30th annual health fair at the Rama MASK featured close to 70 exhibits designed to provide visitors with healthy lifestyle tips and information about various diseases. 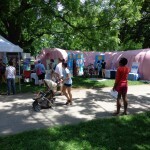 Over 450 people attended the fair. 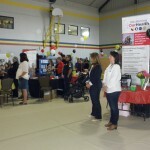 There were also reflexology, massage therapy, blood-pressure checks and foot assessments exhibits along with mini-workshops, including yoga, CPR and use of traditional medicines. 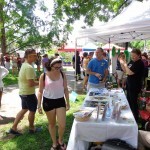 A delicious and healthy hot buffet lunch was served to all in attendance. 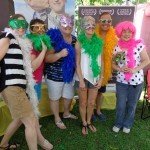 Thanks to all the organizers and fundraisers who made this event possible. 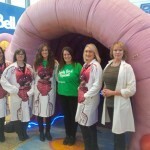 The Giant Colon Tour visited the beautiful University of British Columbia’s campus for the second time this year. 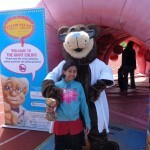 The Crohn’s and Colitis Foundation of Canada’s (CCFC) Vancouver Chapter held their annual “Gutsy Walk” June 9th, 2013 at Thunderbird Park and the Giant Colon was the main attraction for their health conscious supporters. 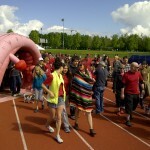 Located at the “Start/Finish” line, over 350 participants walked through our large pink colon during the event. 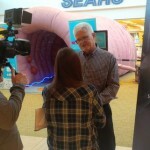 The Giant Colon Tour stopped in Quebec City for three days from May 9 -11 as part of the Salon Vancances Évasion in Les Galeries de la Capitale. 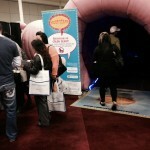 Over 6,500 people passed through our fabulous interactive 40 ft. long colon. 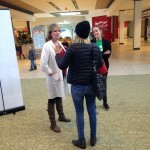 Many thanks to our great volunteers Jeannette Pane and Jacynthe Boudreault who joined staffers Dave Black and Frank Pitman to help spread colorectal cancer awareness.